ATCHISON — In a time when politics, war, prejudice and greed seem to dominate the headlines, one small youth group here is working to make a positive impact on a 43-year-old struggle. 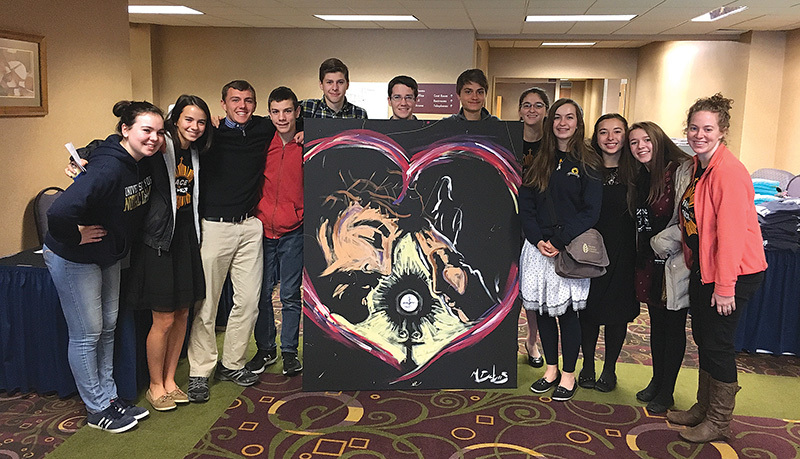 A couple years ago, Maur Hill-Mount Academy senior and Atchison native Christopher Rziha witnessed the passion his generation had for the pro-life movement — but he also observed a lack of direction. His peers, he thought, needed an organization through which to funnel their energy and advocacy. So, he considered starting a pro-life youth group. But a chance encounter on a hike finally gave Rziha the inspiration he needed to get the group going. Rziha participated in the Father Emil Kapaun pilgrimage last summer, which is a 60-mile walk from Wichita to Pilsen, with the intention of sainthood for Father Kapaun. During the walk, Rziha met a youth minister from Pittsburg, who was also the mother of a miracle recipient of Father Kapaun. He ran the idea of the group by her, which she responded to with enthusiastic support and encouragement. The Servants of St. Gianna pro-life youth group was thus born. The group meets monthly with a focus on spiritual adoption. Each member spiritually adopts a child in danger of abortion for nine months, praying and sacrificing for him or her. After month nine, the group will offer up their children before Mary at a Mass and will then have the choice to adopt a new child. Rziha said the ultimate goal for the group is to ensure their spiritually adopted children are born safely. The group also invites keynote speakers to their meetings, like the Sisters of Life. There are different events, games and an action-aspect added. The group got a rare chance to see the results of their efforts recently when Rziha received an email about a woman in Topeka who was planning on having an abortion. The group quickly headed to Mary’s Grotto at Benedictine College and began praying for the woman’s conversion of heart. The group currently has around 22 members, with the majority being Maur Hill-Mount Academy students, as well as a couple of local home-school students. “We’re from different classes, different friend groups,” said Rziha. “This is something they find they have in common. Something they are passionate about that they weren’t sure what they could do about, but this gives them something they can do to help end abortion. The fight to end abortion is nothing new, but Rziha thinks he and the other Servants of St. Gianna can come at it from a new angle. Rziha plans to attend either Benedictine College or the University of Dallas next year and will be taking his pro-life passion with him.